Another Earth opens on a night of dramatic occurrences. Rhoda Williams (Brit Marling), a brilliant seventeen-year-old who's just gotten into MIT, causes a car accident which leaves a man in a coma and kills his wife and son. Just as she steps out of the car, shell shocked, to survey the damage she's caused, the radio broadcasts that a new planet has been discovered in the night skies—one that scientists believe could be very similar to Earth. Four years later Rhoda gets out of prison, her prospects now ruined, and discovers that the man she put in a coma, an accomplished composer (William Mapother), is now living alone, barely able to function in the wake of the tragedy. The new planet, meanwhile, has become a permanent fixture, hanging over the horizon night and day, several times the size of the Moon. It's been confirmed to have continents and atmospheric conditions that parallel Earth's and has now become known colloquially as "Earth 2." 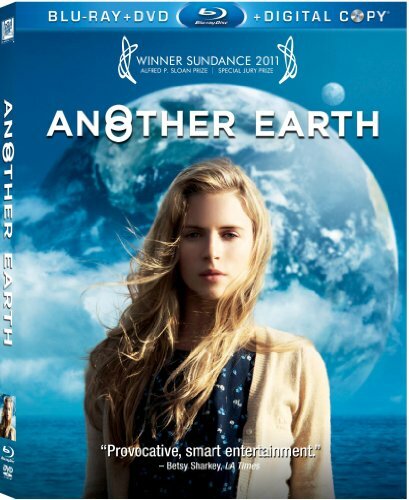 Another Earth is the debut effort of director Mike Cahill and was co-written by him and lead actress Marling. Neither Cahill nor Marling have any formal training in cinema (they met while majoring in economics at Georgetown), but their credentials as cinephiles shine through the film. Citing the likes of Julian Schnabel and Krzysztof Kieslowski as their influences, it's clear Cahill and Marling spent years watching the kind of films the average moviegoer in the US is unlikely to be exposed to. Another Earth feels like a movie aimed at the Cannes film festival rather the Oscars, relying on aesthetics not commonly associated with blockbusters. It's a slow, moody picture, shying away from conventional Hollywood narrative. It's introspective, with long, static shots of its protagonists and many scenes of seemingly mundane activities. It strives to establish a mood, an intimacy with its characters. It invests everything in the viewer's ability to understand and identify with the protagonist. For this reason, the movie rests squarely on Marling's shoulders. The plot is nothing but an attempt to get inside her character's head—to feel what she feels. And Marling, despite a relative lack of experience, delivers in spades. She spends most of the movie silently observing the world around her, so her communication mostly comes in the form of facial expressions and body language. But Marling is the sort of actress who can convey a multitude of conflicting emotions with a single gesture or a look. In terms of direction and cinematography the movie is equally exceptional. The special effects are subtle and sparse and work wonders to make the viewer believe in this everyday setting, a city cast in gray, every bit our world in 2011, suddenly faced with an additional planet looming over our horizon. The deliberate framing of shots, the lighting, the sometimes shaky camera work, all serve to emphasize Rhoda's isolation and detachment, her sense of no longer belonging. The film is beautifully scored, with instrumental tracks consisting mostly of violin and piano, overlaying the beautiful visuals with yet another evocative, emotional element. Unfortunately the same cannot be said of the movie's script. Another Earth feels like a story that needed at least one more round of editing. It's a movie that wants to be Tarkovskiy's Solaris (1972), stylish, languorous, and moody, or at the very least Kubrick's 2001: A Space Odyssey (1968), full of impact if more aesthetically conventional, but in fact manages to be something far simpler than both of these films. The philosophical insights the movie so obviously struggles for—ruminations on human nature and what each of us would do if faced with an alternative version of ourselves—culminate in fairly conventional ways. Rhoda's life is characterized solely by her regret over causing the car accident and her quest for redemption. She can't help but fixate on Earth 2, the alternative universe where her life might have turned out differently, where she might not have made that one fateful mistake. Clichés are clichés for a reason—Rhoda's emotional arc isn't particularly original or complex, but it does offer a lot of room for variation and creativity. Another Earth is very much the sort of slow movie that relies on characterization rather than plot twists. The structure of the script demands that the main characters have exceptional depth so we might spend an hour and a half getting to know them. The movie wants the viewer to be slowly drawn into the world of the characters, setting up the expectation that this intimate deconstruction will yield insights about human nature that a faster paced, more conventional narrative would perhaps not be able to arrive at. Unfortunately the movie never manages to reach those high notes. In her search for forgiveness and redemption Rhoda tries to get close to John and find a way to help him get his life back together, taking advantage of the fact that he doesn't realize who she is. Her journey is at times refreshing, at times predictable but still enjoyable, and occasionally descends into cliché and loses all depth and believability. Another Earth is rooted in escalating tension—will John realize who Rhoda is before they grow too close? Will the discovery of Earth 2 allow Rhoda to erase her mistake before she's overcome with guilt?—but it never manages to satisfy the expectations it creates. The most climactic scenes of the film feel as though they should be a little unsettling, revealing a deep, uncomfortable truth. Instead they are entertaining, well acted, impactful, but never quite reach their explosive potential. A level of depth is missing, a level of risk in how far Marling and Cahill are willing to take their protagonists and their premise. Things are resolved too quickly, too prettily, leaving the viewer with the sense of wasted potential. The movie doesn't really delve into the dark, unsettling, extraordinary places a science fiction concept of this sort allows for. Earth 2, even as a metaphor, never plays a truly challenging, rule-changing role in Rhoda's narrative. Like other elements of the script it's never fully utilized. It serves as a very limited metaphor for Rhoda's desire for a second chance and doesn't affect any of the other characters. There are occasional references to how the rest of the world is handling the phenomena, but as far as the movie is concerned Earth 2 might as well be a figment of Rhoda's imagination for all the impact it has on the people around her. This feels like a missed opportunity in a movie about human nature that does have quite a few characters aside from the protagonist, all representing different attitudes and life philosophies. Another Earth is a movie that's meant to stay with the viewer—through stunning cinematography, a lyrical, instrumental score, and scenes meant to be filled with profound emotional encounters. However the story lacks a certain level of sophistication and the characters aren't complex enough to carry an entire film. Ultimately, no scene is powerful enough to remain with the viewer long after the movie's finished. This doesn't make Another Earth a bad film—it's still enjoyable and entertaining and, if one enjoys non-Hollywood aesthetics, is a welcome relief from major science fiction blockbusters. But it makes the movie feel like an effort that didn't quite come to fruition. Which, for a first feature film from two economics majors, is not bad at all. One hopes Cahill and Marling's next project will be even more impressive and perhaps reach the standards they set for themselves but didn't meet on this one. Marina Berlin (marissa.go@gmail.com) holds a degree in Film, Sociology, East Asian Studies, and several other subjects that make her resume seem completely made up. She's fluent in four languages and can order a stiff drink in a dozen more. In her spare time she enjoys writing articles, reviews, and short stories as well as fawning over other people's cats.